According to the authors of this new publication, the “driving factors for the liquor laws of Canada are two-fold”: the first is the need to exert control over the manufacture, sale and consumption of liquor in the interests of public safety, and the second is raising revenue – through, for instance, taxes – from that manufacture, sale and consumption to subsidize government services. 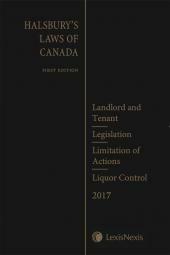 Liquor Laws of Canada examines both of these aspects of the provincial and federal legislation that regulates the Canadian liquor industry. Donald J. Bourgeois, B.A. (Hons. ), LL.B., is one of Canada’s leading authorities on charities and not-for-profit organizations and gaming law. He is the recipient of several awards, including the AMS/John Hodgson Award from the Ontario Bar Association in recognition of his leadership, development of the law and service in the charitable arena; The Amethyst Award for Outstanding Achievement by Ontario Public Servants; The Queen Elizabeth II Diamond Jubilee Medal for dedication to his community and work to engage and inspire its residents; and, most recently, The Mayor of Kitchener’s City Builder Award for 2016. Mr. Bourgeois was General Counsel at the Alcohol and Gaming Commission of Ontario and has a private practice that focuses on liquor, gaming and other regulated industries in Canada. He is counsel to Fogler, Rubinoff LLP and is an Adjunct Professor at Osgoode Hall Law School. 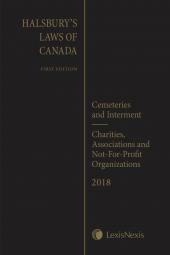 Mr. Bourgeois has written extensively on the topic of charity and not-for-profit law, including several editions of The Law of Charitable and Not-for-Profit Organizations; Charities and Not-for-Profit Fundraising handbook; Charities and Not-for-Profit Administration and Governance Handbook; and the Charities, Associations and Not-for-Profit Organizations and Liquor Control titles for Halsbury’s Laws of Canada. 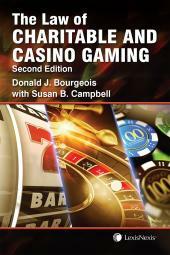 He is also the author of Public law in Canada and lead author for Election law in Canada and The Law of Charitable and Casino Gaming. Mr. Bourgeois has served as an officer and director of several key community and arts organizations, and as chair and member of various municipal and provincial government organizations and advisory bodies. Craig Slater, LL.B., is the General Counsel and Director of Legal Services at the Alcohol and Gaming Commission of Ontario. He joined the Commission in December 2012, and in his position, is responsible for providing it with legal services and representation. Prior to joining the Commission, he spent 28 years at the Ministry of the Attorney General of Ontario, including four and a half years as Director of the Crown Law Office – Civil with responsibility for the management of civil litigation involving the Ontario provincial government. Mr. Slater was called to the bar in 1983. He has appeared before numerous courts and administrative tribunals and has worked on a wide variety of issues in public law.